I’ve had a bit of a thing for trying new perfumes recently, but one in particular has me really excited. 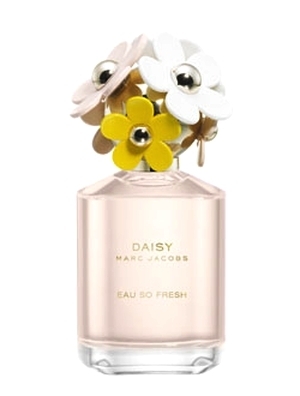 Marc Jacobs is releasing a new version of his famous ‘Daisy’ fragrance, called Daisy Eau So Fresh. I’ve been going on an on about this since I first had a sniff about a week ago – as someone who isn’t a lover of the original Daisy fragrance (I find it a bit too floral for me, despite wanting to love it) I was quite surprised by how much I liked it. I put some on and couldn’t stop smelling my wrists, went to Superdrug and was asked what perfume I was wearing and even the boyfriend loved the scent. A winner on all fronts. Described as having top notes of ruby red grapefruit, raspberry, green leaves and pear, middle notes of violet, wild rose, apple blossom, lychee, jasmine petals and base notes of musks, plum and cedarwood. I love the fruity addition to the scent and the musks and cedarwood add a certain ‘powdery’ scent to the perfume that has made me basically fall in love. It’s not out until Feb 2011 (27th to be precise) and I can guarantee I will be one of the first in line. I’m not into fragrances but I LOVE this bottle with the little flowers!